Naming your cat presents a unique challenge for many people. You have a fuzzy new member of your household, so do you give them a cutesy name like Kitty Fru Fru, a human-sounding name like Steven, name them after a famous cat like Garfield, pay homage to a character from your favorite book or movie, or do you go with something else entirely? 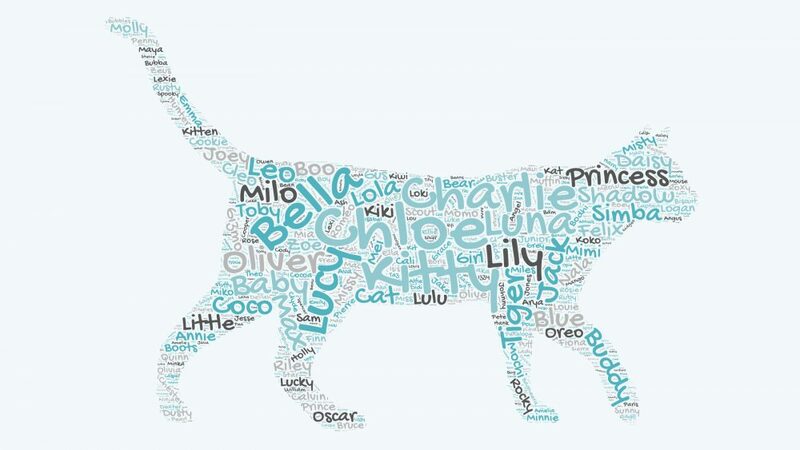 As we were getting ready to give our Marina del Rey location a new name, we got to wondering… what are the most popular cat names? To find out, we turned to the data! We analyzed all the names of our clients’ cats for the past 3 years, and after sorting through over 4,600 of them, one clear winner emerged. Meaning “wisdom” in its original Greek, Sophie is a wise name choice for a female cat (sorry, we couldn’t resist). Lions, Tigers, and Shadows… oh my – the 14th most popular name is a 5-way tie. While Simba is a male cat name popularized thanks to Disney’s The Lion King, it also actually means lion 🦁 in Swahili. And Tiger means… well, Tiger 🐯 – and is a name used for both male and female cats. Not to be overshadowed by names inspired by their larger cousins, Shadow is another unisex name quite popular for Black cats. Buddy, of course, is a name that draws its origins from friendship, and is quite a fitting name for many fuzzy members of the household. The name Jack is another typically male name – and draws its origins as a “pet name” given to men named John during medieval times… which makes it particularly fitting as a name for your actual pet. Of all the names on our list here, Coco and Lola are probably the most fun to say. They’re both also names common for female cats. Lola is typically another “pet name,” or nickname, given to women named Dolores – but it’s just a fun name to give to a kitty too. Meanwhile, Milo is a name most often used for male cats, and was popularized thanks to the adorable movie Milo & Otis. Oliver is most commonly used as a name for male cats, and draws its metaphorical roots to those of the olive tree. In biblical references, the olive tree symbolizes fruitfulness, which is fitting with how common the name is. In all likelihood, the name was popularized for cats thanks to the Disney movie “Oliver & Company”. By itself, the name “Kitty” is tied for the fifth most popular name for cats. However, if we were to expand our criteria to include other names that include the word kitty (for example, Kitty Smalls or Mr. Kitty), then it would quickly jump to the top of the list. But we’re being sticklers for the rules here, and are listing the most popular names, not the most popular types of names. In any event, Kitty is derived from the word kitten… which you’ll remember from High School biology is a type of small cat 😉. Luna means “the moon” in Latin, and is a very popular name for female cats. The name has become increasingly popular in recent years, though the internet doesn’t seem to agree why. Some say it’s thanks to Chrissy Tegan sharing pictures of her daughter Luna, others suggest it’s thanks to the popularity of the character Luna Lovegood in Harry Potter. All we know is that it’s a lovely name no matter the reason people have chosen it. Tied for second place, Bella, Charlie, and Lucy are all excellent names for a cat. While Bella and Lucy are typically used for female kitties, Charlie is a name that can be used for both male or female cats. Bella translates to “beautiful” in Italian, and is a… wait for it… a beautiful name for a cat. Charlie is seen as a very friendly name, and has its roots in a German word meaning “free man” – though we hope you don’t let your Charlies roam free through your neighborhood. The name Lucy is derived from a word that translates to “bringer of light,” which is a fitting name for a creature that brings such light to our lives. Meaning “little green shoot” in Greek, it’s easy to see why it’s a popular name for cats… because… cats… ummmm… like to nibble on little green shoots? Yeah, actually, we’re stumped as to why the name became so popular, other than the obvious reasons that it’s short, sounds beautiful when you say it, and ends with the “long e” sound so popular for pet names. What we do know is that it’s a great name, and we’re delighted to be able to take care of so many kitties named Chloe.